Wunder schlecht. Leave it to the Germans to find a phrase that embodies both joy and sorrow, an emotion that I, as a longtime fan of the late Terry Pratchett, felt when I read this anthology of his writings, each introduced by comments from the author. A BLINK OF THE SCREEN encapsulates the creative evolution of a “middling” (Pratchett’s self-description) 13-year old student whose interest was permanently focused on writing when he was paid the monumental sum of 9.43 pounds ($14) for an English class homework assignment. He knew then what he wanted to do for the rest of his life. This collection of shorter fiction contains flickers of what would become future characters in the Discworld series, along with personal observations on, and grumblings at, the human condition. "This collection of shorter fiction contains flickers of what would become future characters in the Discworld series, along with personal observations on, and grumblings at, the human condition." A BLINK OF THE SCREEN is directed at the countless fans of one of the bestselling authors of our time. However, it may not be the best introduction of Pratchett’s work to a newcomer because it contains so many insider glimpses of his genius and characterizations that are likely to be lost on anyone unfamiliar with his genre-defying work. But to a collector and longtime reviewer, this is the motherlode to be mined as we remember and mourn the loss of this brilliant satirist and humorist. Death is a major character in each of the 40 Discworld books. The cloaked figure on a white horse is never threatening nor is he villainous. Death is a personality vested with a wicked sense of humor, who usually arrives abruptly and departs with a wry comment. If you allowed your eye to wander across a page spread, you knew somebody is in for it because Death’s dialogue always appears written in FULL CAPS. He intones, often succinctly, as introduced in the very first Discworld book, THE COLOR OF MAGIC: “SHALL WE GO? asked Death.” Or he might try to reason with a reluctant soul: “IT WON’T HURT.” Oddly, I always look forward to his appearance because he makes me laugh. 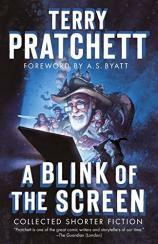 Pratchett created a discourse in 2004 for an online game called TimeHunt that he called “Death and What Comes Next,” which appears as a chapter in A BLINK OF THE SCREEN. In it, Death exchanges theories on life and death with a dying philosopher who offers the concept of Schrodinger’s Cat as the center for debate as his light begins to fade. The philosopher argues that he is dying in only one dimension and may, in fact, still exist in another. This is a pure Pratchett device of interlacing theory, fantasy, inevitability and humor to convey the human condition. Death’s last line is a real knee slapper, at least if you know your Pratchett --- and your philosophy 101. As his one continuing character, Death, came to Pratchett in the end, one wonders if he tried to argue his way out of it, as the wizard Rincewind did successfully in THE COLOR OF MAGIC. Or did he simply fall in beside Death when he heard “SHALL WE GO?” and slip into that great unknown? Fortunately, for those of us still around, we have nearly 70 works, some as collaborations but most as original pieces, to savor. I plan to do just that this summer during the desert doldrums and enjoy once again the adventures of the trolls, dragons, dwarves, witches, wizards, werewolves, assassins, golems, elves, corrupt officials and others who live on and beneath Discworld.